Get a taster of K4H with this year’s video. A rather moist day with 29 teams doing their best to stay on the track. But still plenty of smiles from the onlooking supporters. This is where it all began in 2010. 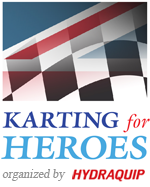 A bright sunny day with temperatures up to 26C saw the first running of K4H with the Armed Forces and Help for Heroes represented by Matt Croucher GC.